Dan heads outside wearing his leather jacket. Diane: Dan! It's freezing out. You need something heavier. Diane: No, you need a Down Coat. Diane: No, "Down" feathers. Not like you. Click on the photos to enlarge. Notice anyone? Every day, the members of the Challengers Dragon Boat team are special. 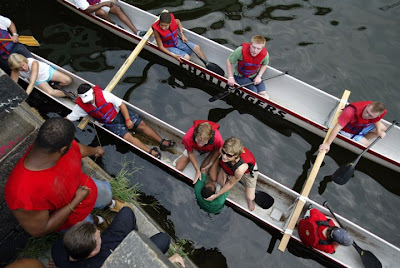 The Challengers, a team of paddlers with Down syndrome, were beginning their return trip toward Boathouse Row on the Schuylkill after a long practice when team members saw a man standing on the Girard Avenue Bridge around 4 p.m.
Then they saw him jump. “He flew like a bird and then, splash,” said Carol Lee Lindner, the team’s paddling coach and mother of team captain Alexis Lindner. The team paddled their cumbersome, 30-foot-long, double hull, practice canoe until they were alongside the man, who was flailing and bobbing in the river. Police tied a rope to the 40-year old man, whose name was not released, and pulled him on to land. He was taken to Hahnemann University Hospital. He was trying to kill himself, police believe. But the Challengers, who are between the ages of 15 and 30, saved his life. Police did not know why he had wanted to commit suicide. Before he jumped, he was talking into a cell phone and yelling while standing on the river side of the bridge fence. He was fortunate that the Challengers were that far up the river yesterday. The team usually leaves its launch from Lloyd Hall, just west of the Art Museum, and turns around well before Girard Avenue. No other boats were in the area. Joan Turek and Carol Lee Lindner hold on to a man who is exhausted from having nearly drowned. The team is practicing for the annual Philadelphia Dragon Boat festival on Oct. 1. They have participated in the event since its inception four years ago. “I love to hear the roar of the crowd,” said Lindner’s daughter Alexis, 30. The Philadelphia version of the 2,400-year-old Chinese tradition was the brainchild of Carol Lee Lindner. The first competition here had 42 entries. This years festival has 128 teams, the maximum that can run the race in one day, Lindner said. Alexis Lindner volunteers with Alzheimer’s patients. Christian White recently won gold medals for swimming in the Pennsylvania Special Olympics. Team members Drew Dolan and Dan Drinker, and volunteer paddlers Frank Kelly, Joan Turek, Hubert White, Chandler White and Sue Dolan, also helped with the rescue yesterday. Diane Drinker arrives at the swim club with a pool chair and her three children. Emily, 4, models her brand new bathing suit which has an inner tube built in. She struts along the side of the pool as the family reaches their usual patch of grass. Dan, 9, sets up his towel next to his brother Will, 8, who tests the water with his toe. Patty: Hey, Di, how are ya? Dan takes his first real notice of Emily's odd looking swim suit. Dan: Will, her suit weird. Why? Will: That’s an inner tube so she can stay afloat. Dan holds up his inner tube, which he’s just finished inflating. Emily: Yeah, well I’m smaller. Dan: Mine bigger. Yours not. Mine better. Will: No it’s not, Dan. It’s just different. Diane: Okay, lunchtime. Who wants to go to the snack bar? Dan: Not me, I stay here. Diane: Dan, we’re all going, you have to come with us. Diane: Come on, we agreed: food first, pool second. I need your big strong arms to help carry the food back here. Daniel Drinker has transformed into… STATUE MAN! Will: Come on, dude. You love the snack bar. Diane: Danny Boy, don’t you want some chicken fingers? Will: Lets just go mom, he’ll still be frozen when we get back. Diane: Patty, can you keep an eye on these two? I'll be right back. Diane: Thanks. Emily, you stay with Dan. Will, you come help with the food. Okay, stay right here. No pool until after we eat. Got it? All this time, Dan’s eyes have remained fixed on a distant lifeguard stand. He has remained motionless. Diane leads Will to the snack bar. Dan and Emily are alone by the pool. Patty's eyes are closed under her sunglasses. Emily gets up and begins to wander the edge of the pool. Dan turns his focus to her but remains still. Emily pauses to watch an older girl dive in head first through her inner tube. Emily looks back at Dan, who quickly averts his eyes back to the lifeguard stand. Emily turns back to the pool and dives in, head first. Because her inner tube is part of her bathing suit, Emily finds herself stuck, upside down. Her head under water, her legs up in the air. Dan returns his gaze to the pool and sees Emily. Emily's legs begin to flail. Dan looks and sees an unaware Patty continuing to sunbathe. ZAP! He shoots up. With a running dive, he's in the pool. He reaches his sister and flips her over. Emily coughs up some water. Diane: I thought I said, “No Pool”? Dan and Emily turn to see Diane and Will standing on the pool’s edge with the food. Watch out! Metamorphic Statue Man!